Cruden Bay tour pro Kevin Duncan carded an eagle and 22 birdies over 54 holes as he chalked up his first Pro Golf Tour victory at Palmeraie Country Club in Morocco. His final two rounds of 63 clinched a notable win for the Scottish Alliance champion who has won six times on the North-east Alliance circuit over the 2018-2019 campaign. The Scot finished the 54-hole event four shots ahead of both Englishman Darren Walkley and Ahmed Marjan from Morcoco who shared second place at 15 under par. Duncan, from Ellon, received 5,000 Euros prize money for the biggest win in his professional career and climbs up to rank fifth on the Pro Golf Tour Order of Merit. "After the last season I was thinking about quitting professional golf. This makes my first win even more special than it already is. It was definitely worth it to continue. "My putts worked out quite well just as my tee shots did. My game really felt very solid the past few days." German Allen John had dominated the event for two days after scoring rounds of 61 and 67. But on the final day John fell off his perch with a 75 on his scorecard which dropped him to 11th place. Fellow Germans Hurly Long, David Heinzinger and Maximilian Oelfke finished jointh fourth. Kevin Duncan, who is attached to Cruden Bay, added to a brilliant spell for Scottish golf by carding a second successive eight-under-par 63 to claim a four-shot win in the Open Palmeraie, an event on the third-tier ProGolf Tour in Morocco. Duncan’s maiden victory on the circuit was secured by some breathtaking golf in Casablanca, where he carded an eagle and 22 birdies over 54 holes to finish with a 19-under-par 195 total. and Paul O’Hara, in tasting success on the German-run circuit. Duncan, who won the Scottish Alliance Championship at Boat of Garten in October, carded an eagle and four birdies in his opening circuit on the Palmeraie course but also a quadruple-bogey 8. He then signed for ten birdies on the Tony Jacklin Prestigia lay-out in the second round before adding eight more in a bogey-free closing effort back on the Palmeraie course. 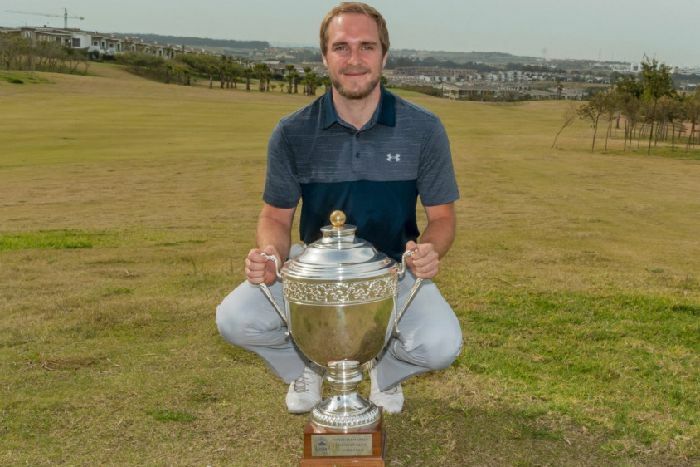 The success comes hot on the heels of wins for Law (Vic Open on European Tour), Michael Stewart (Katameya Dunes Lakes Classic on Med Tour) and Euan Walker (African Amateur) in the past fortnight. Hoping to add to that purple patch this weekend are Bob MacIntyre, Grant Forrest and Connor Syme after the talented tartan trio all turned on the style to safely make the first of two cuts in the ISPS Handa World Super 6 Perth event. Maintaining his impressive start on the European Tour, left-hander MacIntyre progressed to the third round in joint-fifth on the back of a five-under 67 at Lake Karrinyup. An eagle and four birdies left the 22-year-old sitting on seven-under and on course to be among the 24 players involved in a final day consisting of six-hole match-play ties along with Forrest (65 for five-under) and Syme (67 for four-under).